Inventory We are a resale marketplace, not a box office or venue. Ticket prices may exceed face value. This site is not owned by Miller Auditorium . The James W. Miller Auditorium opened in 1968 on the campus of Western Michigan University. 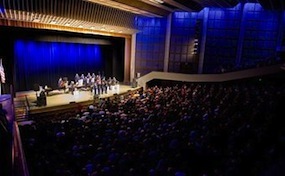 The Miller Auditorium, as it is commonly known, has a seating capacity of 3,497 with three different levels in the theater. The Miller Auditorium box office is located at 1903 West Michigan Avenue in Kalamazoo. Miller Auditorium tickets have included popular traveling Broadway shows like Phantom of the Opera, Beauty and the Beast, Wicked, and Chicago. Miller Auditorium concerts have hosted Bruce Springsteen, and Bob Dylan. The Campus Activities Board runs the venue. Miller.AuditoriumKalamazoo.com is not affiliated with Western Michigan University, any official website and or box office. We are an independently owned and operated company that concentrates in the online marketing of all events in the secondary industry. Ticket prices may fluctuate above or below face value and can change with demand. To order tickets to all Miller Auditorium Kalamazoo event call our operators at any timer or select the performance of interest on the site and click through to checkout.